Do you have one food that your parents fed you ALL THE TIME and you therefore can no longer eat it? I thought mine was pork chops, mostly because shake and bake pork chops were served about three times a week in my house. That and Stove Top Stuffing. 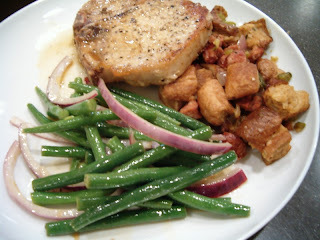 So, when I saw Rachael make Pork Chops with Andouille French Bread Stuffing & Green Bean Salad on her talk show, I challenged myself to make it, if only to overcome my hatred of pork chops and stuffing. Since I never make pork chops and stuffing, this ended up being a great departure from the usual for us. Place a medium-size pot of salted water over high heat and bring up to a boil. While the water is coming up to a boil, place a medium-size skillet over medium-high heat with 1 turn of the pan of EVOO, about 1 tablespoon. Add the chopped andouille sausage and cook, stirring every couple of minutes until it is brown and crisp, about 4-5 minutes. To the skillet with the sausage, add the celery, green bell pepper, chopped red onion, 3 cloves of chopped garlic, bay leaf, thyme and hot sauce to taste. Cook, stirring frequently, until the onions are tender, about 5 minutes. Add the bread cubes and enough chicken stock to moisten the bread, about 1 1/2 cups; you want the bread to just barely stick together with the andouille and veggies. Remove the bay leaf and take off the heat to keep warm. Add the green beans to the pot of boiling salted water. Cook 1-2 minutes for crunchy beans or 4-5 minutes for softer beans. [Go crunchy!] Rub the inside of a large bowl with the whole garlic clove. [When making this just for the two of us, I make the dressing in a separate bowl so that we don't drown the salad in dressing. I just find it difficult to cut a recipe like this in half.] Add the mustard, honey, white wine vinegar and a dash of hot sauce and whisk to combine. In a slow steady stream, whisk in 1/3 cup of EVOO. Add the sliced red onions and the warm beans, season with salt and pepper and toss to combine. Remove the pork chops from the oven and transfer to a plate. Cover loosely with foil and let rest. Add the Southern Comfort to the pork chop skillet away from the heat then return the skillet to the stovetop over medium heat to let the alcohol cook out. (Remember: the handle is very hot so use a kitchen towel or pot holder to move it about.) Once it is done flaming, scrape the bottom of the pan with a wooden spoon to release the brown bits. [No flaming for me.] Add the remaining 1 cup of chicken stock and turn the heat up to high, cooking until the stock has reduced by half. Turn the heat off and add the butter, stirring until it has completely melted. To serve, divide the andouille-French bread stuffing between 4 plates, top each portion with a pork chop then pour a little of the Southern Comfort sauce over the top of each chop. Serve the green bean salad alongside. That looks delicious. I'm going to try it.